Dentistry was not the obvious choice of profession for me. Although my father was a dentist my entire life, I only realized in college that dentistry is as much an art as it is a science. A profession which I always thought of as “gross” suddenly captured my interest. I began my dental training in 1998 at the University of Florida College of Dentistry and was immediately drawn to the possibility of creating and shaping teeth....and smiles. In school we were taught to be very “hands on” in our designs. This allowed us to learn proper form, function, and sequence of events. When I graduated and began practicing in 2002, I was immediately disappointed by a rude awakening: that dental laboratories have more control over the finished product than we do as dentists. As such, when I opened my Wellington, FL dental practice I immediately formed strong relationships with a few of the best laboratories so that my clinical outcome would consistently be excellent. Delivering the highest quality of care possible has been my mission from the inception of my practice. It is for this reason that I view myself as a perpetual student of dentistry. I consider advanced dental studies on learning new techniques and adopting improved philosophies to be my obligation. As such, it is my pleasure and privilege to introduce a product which has revolutionized dentistry. I am truly delighted to welcome CEREC® to my Wellington, FL practice. I am committed to providing the highest quality care to my patients and am so happy to introduce CEREC® to you. CEREC® uses an advanced digital imaging wand which provides an exact digital replica of my patients teeth. Not only is my preparation precisely captured, but the opposing teeth and bite are accurately determined. When I first began working with this technology, I was astounded by the accuracy. The fit of my restorations is not only excellent...it is perfect. It is a top priority that my patients feel well taken care of. Referrals from our patients are the best compliment we can receive. We are so very proud of our high number of friends/family referrals from our existing patients. It is such a pleasure to retain such a high percentage of our patients year after year. I value our patients loyalty and happily warranty our CEREC® restorations for 10 years. These restorations are just so life-like. New patients have complained of the “black lines” along the margins of their old porcelain fused to metal crowns for years. CEREC® crowns are completely metal free which means our patients will love the way they look now.....and years from now. So even if the gum line drops, these restorations will continue to appear natural. Getting numb is usually the part of the visit patients like least. For conventional crown/inlay preparations patients receive anesthesia for the first visit and are given the option of getting numb for the placement of the permanent restoration. For those who choose to “grin and bear it” they experience moderate sensitivity to the cold air and cementation process. With one-visit CEREC® crowns and inlays/onlays you will be numb the entire visit, this process defines truly “pain-free” dentistry. Most of my patients have a busy schedule and I appreciate their setting aside an hour and a half for their crown procedure. Conventionally, a temporary crown is placed at the end of their visit and they are appointed in about 2 weeks for the placement of their permanent restoration. CEREC® uses a state of the art milling unit to fabricate the crown in less than 15 minutes. Our patients get their crowns the same visit as their tooth preparation! What does this mean for you? Convenience, comfort, reliability. Convenience: This is the reason I first considered CEREC® technology. So many of my patients find it difficult to work lengthy dental visits into their schedules. Not to mention the inconvenience of instances when temporaries loosen or come off before the permanent crown/inlay is back from the laboratory. Receiving a precision fit crown/inlay which equals (and frequently exceeds) the quality of a lab fabricated restoration on the same day as tooth preparation is of tremendous value for our busy patients. Upon completion of your tooth preparation, Dr. Kaufman will use the CEREC® scanning wand in lieu of taking a messy impression or mold. 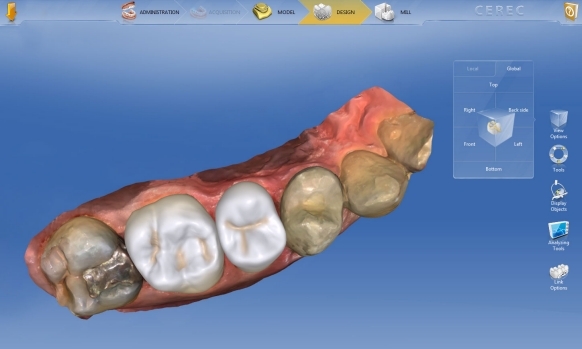 The wand takes a live video of the preparation site and creates an exact 3-D model replica of your tooth/teeth. The detail in this 3 dimensional model is far superior to what can be achieved using old fashioned impressions and stone models. 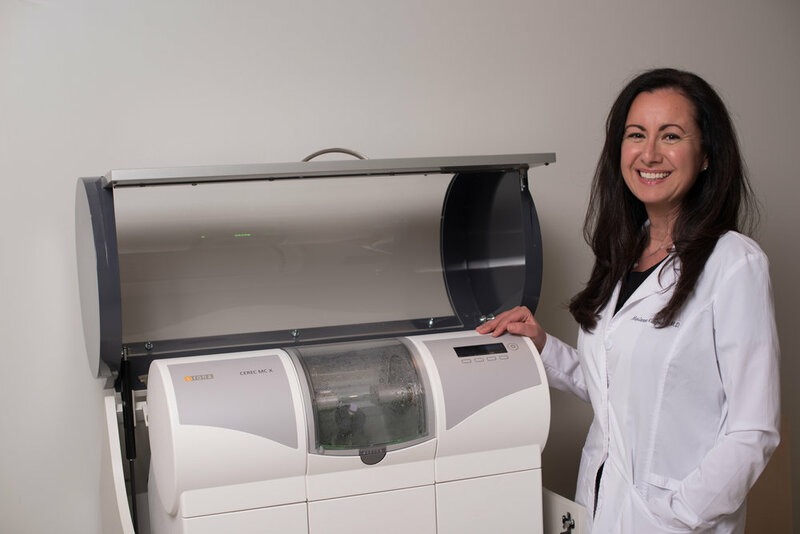 The sophisticated CEREC® software allows Dr. Kaufman to maximize her years of experience and thousands of continuing education hours when designing your custom dental porcelain restoration(s). It is her mission to design each unit with the utmost goal of providing her patients with years of comfort, beauty, and function. 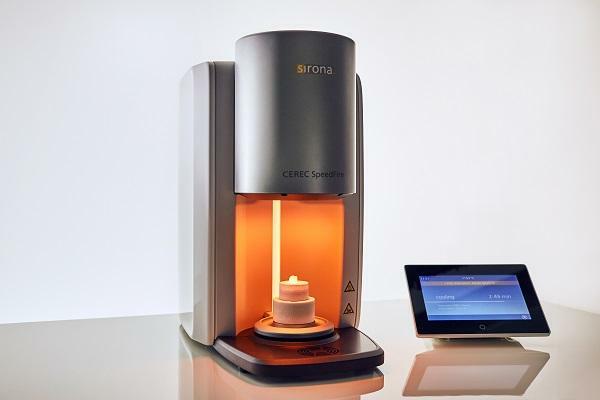 CEREC® uses the most highly rated porcelain materials available on the market. EMAX®, one of our strongest and most beautiful options, is a very common choice for Dr. Kaufman. She will choose a shade that most closely resembles your neighboring teeth. The corresponding solid porcelain block will be inserted for the milling process. In addition to a sleek, modern, and compact design, the CEREC® milling unit boasts the power of a commercial device. Upon insertion of the solid porcelain block, Dr. Kaufman remotely transfers her original design to our milling unit. Our patients have the opportunity to watch their custom porcelain restoration spring to life! Once the unit is milled to Dr. Kaufman’s specifications, she now embraces the opportunity to customize each piece using stains and glazes. In doing so, Dr. Kaufman ensures that your porcelain restoration appears as natural as possible. For example, she may provide a very light ombre effect which blends the porcelain seamlessly to the tooth. At last, your custom porcelain restoration is ready to be sintered. Our sintering oven gradually raises the temperature of each unit to, in excess of, 1000 degrees. This high temperature is necessary strengthen the porcelain and lock in the unique characterization added. Once cool, your restoration is ready for insertion!